Meals and snack time in my house are always healthy and balanced. I am always introducing different foods to my daughter to expand her knowledge on cuisines. She is adventurous and loves all types of vegetables. Unfortunately, she will only eat three types of fruit — apples, grapes and cantaloupe. I have tried different ways to get her to eat other fruits. She won’t even drink smoothies or eat yogurt, so I end up resorting to fruit juices. The problem is most 100 percent fruit juices could have 25 grams sugar or more! 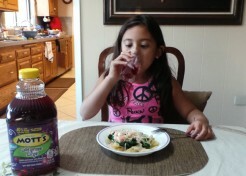 Mott’s is a brand that I trust to provide my child healthy foods, so I was excited to discover their new juice drinks. The ingredients are simple: water, vegetable and fruit juice concentrates, ascorbic acid (vitamin C), citric acid, natural flavors, and stevia leaf extract. There are no artificial sweeteners. Plus, it contains only 15 grams of sugar per serving! My daughter loves the delicious flavors Mott’s juice drinks come in, like Strawberry Boom (I really like because it reminds me of strawberry gelatin) and Wild Grape Surge (my daughter says it makes feel like she is in a grape jungle). One of the Motts juice drink 8 ounce bottle provides one fruit serving and 100 percent daily value of vitamin C, so they are perfect to pack in her school backpack or dance bag.